Google adds another one letter domain name to its collection. In May I wrote about how Google may have purchased the domain name G.me. 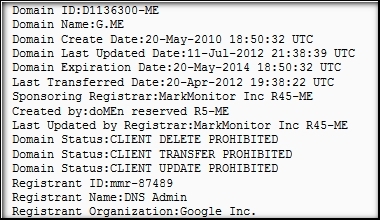 The domain name was registered to Mark Monitor’s DNStinations, which often times registers domain names on behalf of the company. Now it’s official: Google was the buyer. The nameservers for the domain also point to Google.com now. Type g.me in your browser and you’ll be forwarded to the plus.google.com. The domain name was previously a registry reserved domain name, which means Google probably bought it directly from the .me registry. Google has acquired a number of other “g dot” domains, including g.co. Google uses g.co as a URL shortener. Did Google just buy G.me? I don’t really understand buys like this if just to forward to a third level domain. Seems unnecessary, they will probably mention to people that you can also go to “g.me” as a shortcut but I doubt it will get much advertising budget spent on it, and everyone will still go to plus.google.com or whatever they have been trained to do. JP, you’ve gotta think ahead 🙂 A good way to put g.me to use is much like Facebook implemented facebook.com/username. Unfortunately Overstock also holds a registered trademark on G.COM having secured O.CO and O.INFO. Could this turn out to be the greatest trademark battle in history? @ Brian – I highly doubt that’s Google. Look at the specimen that was submitted with the application. I have been following these applications for a while , started as a mysterious company then suddenly the application was taken over by an Amazon Attorney, abandoned and paved way for the current Amazon’s A.COM trademark. Same old tricks of going through MarkMonitor or private individuals .